Here, combined in one volume, are ten of Dr. Seuss's tallest tales, taken from three of his best-loved storybooks - The Sneetches, Yurtle the Turtle, and I Can Lick 30 Tigers Today! Packed with zany pictures and hilarious rhymes, the tales make enchanting bedtime reading. 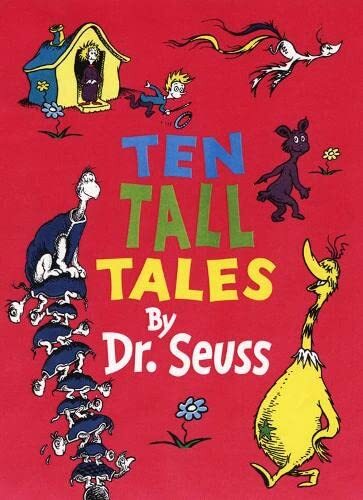 Here, combined in one volume, are ten of Dr. Seuss's tallest tales, taken from three of his best-loved storybooks - The Sneetches, Yurtle the Turtle, and I Can Lick 30 Tigers Today! Packed with zany pictures and hilarious rhymes, the tales make enchanting bedtime reading.Children will be tickled pink to meet the Star-Bellied Sneetches - whose bellies bear stars - and their rivals the Plain-Bellied Sneetches - who have none upon thars! Or King Looie Katz, king of Zatzen-stein, who makes his courtiers follow him round so his beautiful tail won't drag on the ground.Then there is the little sister who thunks a glunk in The Glunk That Got Thunk and gets more than she bargained for. Or the stubborn Zax who would rather have highways built over them than budge in their tracks.With Dr. Seuss's unique combination of outlandish storytelling and bold illustrations, these and a host of other characters are hilariously brought to life in this wonderful book.